My first go round with this topic was written back in 2011, which was before the roll out of Obamacare. Now that Obamacare has been in force for a complete calendar year, it’s time for an update on this very important topic. Herewith, 20 part-time jobs with health insurance 2015. In a way, the 2015 edition of this list is so much more important than the original one. It’s generally assumed that Obamacare took a wrecking ball to the insurance industry across the board, and forced employers to abandon providing health insurance for their employees, particularly those who work part-time. This updated list proves that that assumption is not entirely correct. When I started this project, I fully expected that to find only 10 or 12 employers offering part-time jobs with health insurance. Instead I came up with 20, and did so fairly easily. As OutOfYourRut.com is first and foremost a site dedicated to navigating the uncertain and often treacherous universe of earning a living in the 21st Century, the availability of health insurance is a mission critical function in that regard. I hope that you will be both educated and encouraged by the information that this update provides. This isn’t just a list compiled for the purpose of creating compelling content. My wife and I currently have our health insurance through a part-time job she holds at a bank. She works 20 hours per week at a small, local bank, and we have full, Obamacare-compliant health insurance for the both of us. My entire purpose in writing the original post back in 2011 was to have a body of research available to use in the event that we needed a Health Insurance Plan B. Though finding part-time jobs with health insurance may not always be the perfect situation, it can be a solution for a lot of people. Please don’t discount the possibility, and please use this list to your advantage. The healthcare world is changing, so it’s entirely possible that one or more employers listed here will drop coverage for part-timers in the not-too-distant future (this article is published March 17, 2015, so the information is current only as of that date). As an example, gone from the original list are Target, Macy’s, JC Penny and Trader Joe’s. Part-time jobs with health insurance often lack any sort of employer subsidy; that will make it more expensive. Many companies offer coverage to the employee only, but there others who will extend coverage to immediate family members. Many of the companies that do offer part-time jobs with health insurance offer only limited benefit plans, which are not true health insurance. To the best of my knowledge, there’s only one employer on this list (Lowe’s) that has such a plan, the rest are all the real deal. You should ask about health insurance for any part-time job you apply for, particularly if they are in industries related to any of the companies on this list. With those points in mind, here are 20 Part-Time Jobs With Health Insurance 2015 edition. Banks are one of the most prolific industry groups to offer part-time jobs with health insurance. 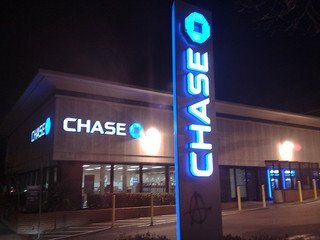 JP Morgan Chase offers health insurance to “all employees“. The site doesn’t provide the details, but it’s a good bet that health insurance will be available for any employee who works at least 20 hours per week. That seems to be the banking industry norm. Starbucks is the company that most frequently appears on this kind of list anywhere. If you work at least 20 hours per week, the company offers its Special Blend benefits package, that includes health insurance coverage for you and your dependents. They also mentioned domestic partners, so we can assume that the coverage extends to spouses. Like Starbucks, Caribou Coffee offers medical, dental and vision coverage to employees who work a minimum of 20 hours per week. You can see from Starbucks and Caribou Coffee that there are certain industries where part-time jobs with health insurance are more prevalent. It’s likely that there other competitors in the coffee house field offering similar benefits. This one is a bit controversial. Barnes & Noble offers health insurance coverage to part-timers but there’s ample scuttlebutt that you have to be with the company for at least one year in order to get it. Still and all, if there were no other choice, this would be better than having no health insurance coverage at all. UPS is another regular on virtually every list of companies offering part-time jobs with health insurance. The company makes it clear on it’s website that it does provide health insurance for part-time staff. However I do have to note that a friend of mine who works for the company indicated that the plan only covers the employee. You will have to pay the full cost of the plan for your spouse and dependents. Costco offers the Part-time Aetna Select Plan for it’s part-timers, and it looks like it extends to family members as well. You can check out the benefits available under the plan on the Benefits Summary. The Fresh Market offers medical coverage and other benefits to employees who work a minimum of 30 hours per week. They offer “low cost medical, prescription, life, dental and vision coverage” for their part-time employees, and their eligible dependents. The 30 hour requirement is certainly heavy part-time, but it is part-time. Oh, and the food at this specialty grocer is top-of-the-line. Even though the chain is fairly small, we had a store near us in Georgia, and also one now that we live in New Hampshire. Safeway offers part-time jobs with health insurance, but does so in select locations. That is to say that while there may be part-time jobs with health insurance at some stores, and in some states, it’s not universal. This seems to be standard practice in the grocery industry, which will also apply to employer #9. Not all hospitals offer health insurance to their part-time staff, but many do. It’s also important to understand that not all jobs in hospitals are purely medical in nature. They also hire maintenance workers, security guards, cafeteria staff, and administrative staff. Florida Hospital located in the Orlando area offers health insurance to eligible full-time and part-time employees at an affordable rate. Coverage is also available for dependents at an additional cost. Florida Hospital is just one example. If you would like to get part-time job with health insurance, check out hospitals in your area. There’s a better than even chance that several of them will have part-time jobs with health insurance. That information is still valid now. And if you like kids, look into part-time bus driver arrangements. They often provide health insurance as well. Lowe’s offers a limited benefit health plan, which is one of those plans that will pay flat dollar amounts per medical event. They aren’t “Obamacare compliant”, which means that you will have to pay the 2015 tax penalty of the higher of 2% of your income, or $325 per person in your household, as if you had no health coverage at all. Still, this kind of coverage is better than having no coverage at all. REI offers medical plans to “full and part-time employees averaging 20 hours or more per week”. They call it the REI Flex Plan, where you can choose from several medical plans for yourself and your dependents. Bonus: REI pays for the majority of employees’ medical plan cost (this is not always the case with part-time jobs with health insurance). Whole Foods Team Members are eligible for benefits if they work at least 20 hours per week and have successfully completed a probationary period of employment (the probationary period term was not indicated on the website). Aerotek is an international temporary agency that offers medical benefits to its contract workers who work at least 20 hours per week. Medical benefits include dental and vision coverage, extending to spouses and dependent children. Check out Aerotek’s benefits page for more information. This can be a perfect way to obtain health insurance if you are between jobs, since transitioning into a full-time position from a contract assignment has become a common practice. This one isn’t certain. Though it routinely appears on various lists of employers offering health insurance to part-time employees, the company website doesn’t say so specifically. Language on the site seems to indicate that benefit terms are determined by the contract arrangement with the individual client company. So the answer here may be that there’s health insurance coverage on certain assignments, but not in others. One of several big banks on this list, PNC Bank extends employee benefits, including medical and prescription drug coverage, to part-time employees. We can probably also assume that the industry standard minimum of 20 hours per week also applies here. PNC has branches all over the Northeast. SunTrust offers health insurance to part-time employees. They have several plans, including an HMO, PPO, and a high deductible account with a health savings account (HSA). Each plan includes prescription drug coverage. SunTrust has branches all over the Southeast. Just as is the case with banks, part-time jobs with health insurance seem to be pretty common among credit unions as well. Massachusetts-based DCU Credit Union offers medical, dental and vision to full and part-time employees who work a minimum of 20 hours per week, and it includes domestic partners. Employees each receive a weekly Café Plan contribution that can be used toward health plan costs. This one took me by complete surprise. In fact, I found it after a desperate search – literally going from from one company site to another – to find the 20th employer to round out this list. But yes, Delta Airlines provides health insurance coverage to part-time employees and their eligible dependents. In fact, they offer three different plans, depending on where you live. One of the things that I found encouraging in preparing this list, as mentioned at the outset, is that I expected to find far fewer companies offering health insurance for part timers post Obamacare. Instead, coming up with 20 was fairly easy (except for Delta – that was a shot in the dark). That leads me to conclude that there are probably scores of other employers out there that also offer coverage for part-timers. One other thing that blew me away was the diversity of industries that these employers appear in. We have banks, credit unions, grocery stores, coffee houses, temporary job agencies, local governments, hospitals, couriers and airlines represented. It’s likely that there other industries with employers who offer health insurance to part-timers. If health insurance is a problem for you, due to either cost or availability, look for a part-time job with the intent of finding one that specifically provides coverage. This list, and the experience of my wife and I, prove it to be possible. I’m not claiming that this is the perfect health insurance solution for everyone out there. But it is an excellent option to have nonetheless. It could be the health insurance answer for people who are between jobs, self-employed, or working at a full-time job that does not offer health insurance. And it’s likely to be whole lot more cost-effective than anything you will find on the health insurance exchanges. Please feel free to weigh in with your thoughts and experiences in regard to part-time jobs with health insurance. It would be to everyone’s benefit if this would become a growing trend in the future. Fairfax is one of the wealthiest suburbs in the country and has some of the best public schools. It is essentially, an extension of DC and Maryland and the rest of Virginia is not much like Fairfax County. In the Virginia General Assembly, Fairfax and NOVA run away with most of the funds and leave crumbs for the rest of the state. That being said: The State of Virginia does NOT offer benefits to part-timers and much of the work in the state is done by part-timers. In fact, DSS, which administers Medicaid and the Obamacare Exchange in VA , offers no health care to part-time employees. However, Henrico County, a suburb of the capitol, Richmond, does offer some benefits to part-time school employees. This is the case in much of the South, which seems to think it is actually part of a different country and federal laws and rules should not apply to Southruners (sic). Bon Secours Health Systems, which is based here, offers part-timers health benefits, etc. Snag-A-Job, also based here, seems to offer some, also. Hi Mary – Thanks for weighing in. I certainly don’t want to give the impression that all government jobs provide health insurance for part-time workers. I did know that the state of Virginia doesn’t, but Fairfax County says so right on their website. I also know from people who work there that Fulton County Georgia offers it to their pt school bus drivers, and because I once toyed with the idea myself. But it’s worth checking county and municipal jobs where ever you live. Some really do, and they’re usually good plans or at least better than what you can get in the private sector. That’s so ironic that DSS doesn’t provide coverage to part-timers, given what they do. In a not so small way it highlights why healthcare is so messed up nationwide. Hi, just wanted to give you a heads up from a BN manager. Barnes and Noble does not offer insurance for any part timers. They have to hold a lead position or a management position. Thanks for the clarification Meagan. If you notice from my wording, the whole idea of health insurance at Barnes & Noble is questionable. The BN website benefits page indicates that they do offer it, but the rumor mill suggests something entirely different. This seems to be one of those all-to-common corporate situations where printed material goes one way, while reality goes in a completely different direction. Company handbooks are an excellent example of this. They exist mainly for compliance and legal cover, but are not representative of how business is conducted every day. Corporations and employers are finding loopholes out of this. You would not believe how many places I’ve worked for or interviewed with who stated they can’t guarantee any more than ten or fifteen hours a week. Hi Ashley – Actually, I would believe it. According to statistics, there are fewer full time jobs now than there were in 2007, just before the financial meltdown. Despite claims of a growing economy, full time jobs are still tight. At least part of this is to dodge the Obamacare requirement. We should expect more jobs to go from full time to part time, unless Obamacare is reformed to remove the employer mandate. But that doesn’t mean you can’t find a part-time job with health insurance. Many of the employers on this list are in industries that run on part-time workers. They offer health insurance as an incentive in a competitive market for good people. Notice that the employers are concentrated in part-time dependent industries. There are probably other employers in the same industries that also offer health insurance. I just accepted a job with Publix in Homestead, FL. They do offer part-time employees health benefits, but only after one year or 1500 hours of employment. So it’s available, but it’s going to take a while to be eligible. With Publix it seems to depend on the store and the district as to whether or not its available. That’s too bad you have to wait so long, but at least it holds out the hope that you’ll have it eventually. It also shows that there are part-time jobs that do have health insurance. But as I mentioned in the post, they aren’t usually as cut and dried as the plans that come with full time jobs. But any health insurance is better than none at all. I’m a Lowes employee and they keep us under 15 hours a week. They do not offer any type of health insurance for part time employees. They will pay for visits to a doctor when you are WELL and that is it. Hi David – Yeah it’s that limited benefit program that I described in the post. Probably more limited than they actually describe. Thanks for reporting in. Peet’s 6 hour shifts are ideal. I found 8 hour shifts as a barista too exhausting, and 9 hour shifts at Safeway, which I worked in the past, completely wiped me out the whole week, (SW is a rough gig). But as an at-home mom Peet’s is a great fit. Peet’s allowed me the time and energy to finish school in the past, so I returned to maintain my family schedule and help cover health care cost. If you have a young working adult (20’s) in your household, it could be a good option as they pursue their young adult goals. Benefits take 6 months to kick in, so it’s no quick solution, but still a good one. In short Peet’s has a great work/life balance with excellent benefits and allows you to use your energy for things that matter in your life. Highly recommend Peet’s if available in your area. Hi Christin – Thanks for the add! I suspect that there are dozens, maybe scores of employers offering part-time jobs with health insurance. For those of you who are unfamiliar with Peet’s Coffee & Tea, it’s a California based chain, started in 1966, with at least 200 stores in California, Washington, Oregon, Colorado, Illinois, Ohio, Pennsylvania and Massachusetts. They’re now owned by the same parent company that owns Caribou Coffee, and a large number of Caribou Coffee stores have been converted to Peet’s. I’ve verified the facts of what you’re saying at Peet’s website. I may include it in the 2017 edition of this article. We may have to expand the list to 25 or even 30 employers! Which is great for us all. You missed a big one, Apple has a nice health benefit for part-time (20+Hours), or at least they did 2 years ago. As I recall you needed to complete 3 months, but eligible after that. And pretty sure that FedEx covers part-time as well again after a period of time like UPS and certain number of hours. Thanks for your research, I was not aware of a couple you mentioned. Hi Sherry – I have no doubt that Apple offers health insurance to part-timers. They also offer work at home! But I’d be reluctant to add them to the list because their website doesn’t specifically say that they have that benefit. As to Fedex, comments on Glassdoor say as much, but once again, the company website doesn’t say so specifically. But if UPS offers health insurance to part-timers, then Fedex is a good bet too. Thanks for the input! namely Catholic & Luthern. Same faith folks sign up & make “donations” instead of premiums and those in need get paid from the community pot. Its kind of new, maybe another option to look into. Take care. Hi Roxanne – Congratulations and good luck on the blog! I actually wrote an updated version of this post for 2017, which will be updated annually. You can backlink to it by inserting this coding into your site: 20 Part-time Jobs With Health Insurance in an article or a sidebar. I am familiar with Christian healthsharing ministries and suggested they might be a replacement for Obamacare when it blows up, which I think is coming. It’s unfortunate that healthcare/insurance has become such a distraction, making it hard for people to change jobs, start businesses or retire early. It shouldn’t be center-stage in life, dominating everything we do, but that’s where it stands today. That’s why I wrote this article, to show people there are options available. And there are, but just like regular health insurance, none are perfect.